Earlier today, my family and I were driving through the Brentwood Mall area when my little one yelled out, “Chicken!” It was lunch time and he wanted exactly that – chicken. Lo and behold, we spotted a Church’s Chicken and decided to make a quick lunch stop for some well, chicken. 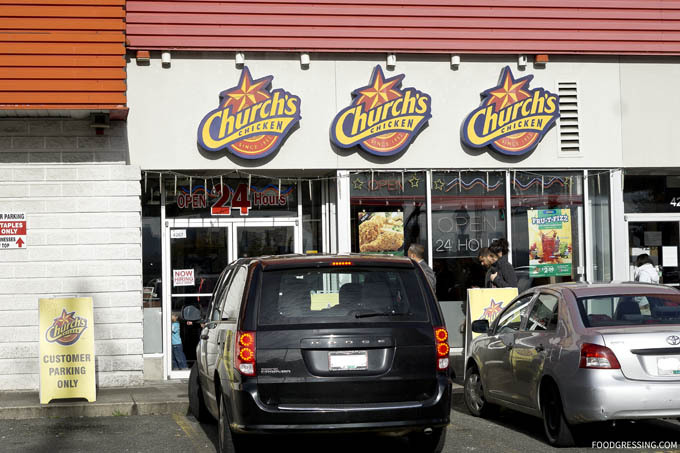 While this Church’s Chicken is conveniently open 24 hours, the parking situation at Church’s Chicken is not the most ideal. There are only 3 spots assigned to Church’s Chicken on the ground level. However, there is rooftop parking with plenty of spots available. The drawback of the rooftop parking is the accessibility. Elevator is available but it takes you directly to inside of Staples, which becomes unavailable when Staples closes for the day. Your other options are the staircase behind the elevator or taking the sidewalk around the building. 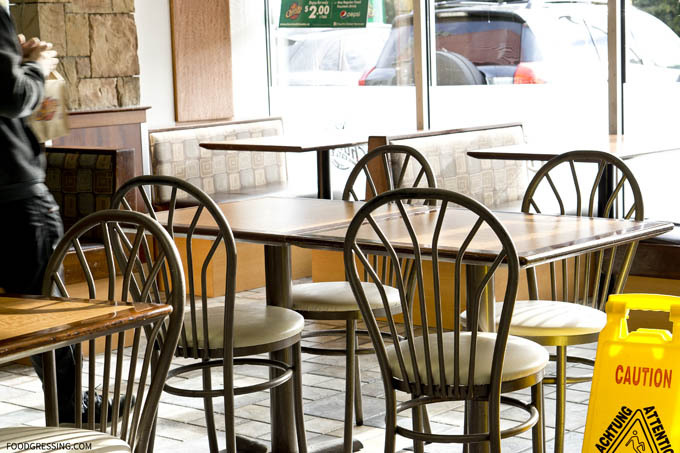 Luckily you don’t need to deal with those inconveniences after hours since you can probably enjoy the “Staple’s customer only” spots on ground level at that time without worrying about getting parking ticket or towed. While this particular Church’s Chicken location is more modern than the Fraser one, cleanliness still appears to be an issue. The tables were visibly sticky and we went around looking for the “cleanest” table to sit at. It was obvious that the tables were poorly maintained between customers. Fortunately, I was prepared and brought baby wipes to clean off our table. 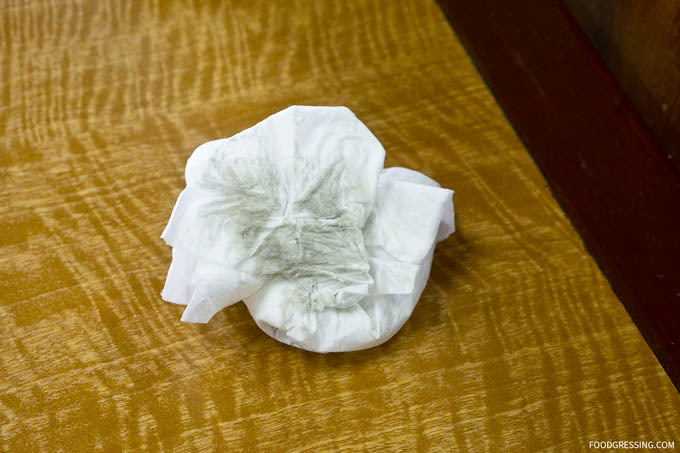 Below is a photo of just one of the several wipes we used. 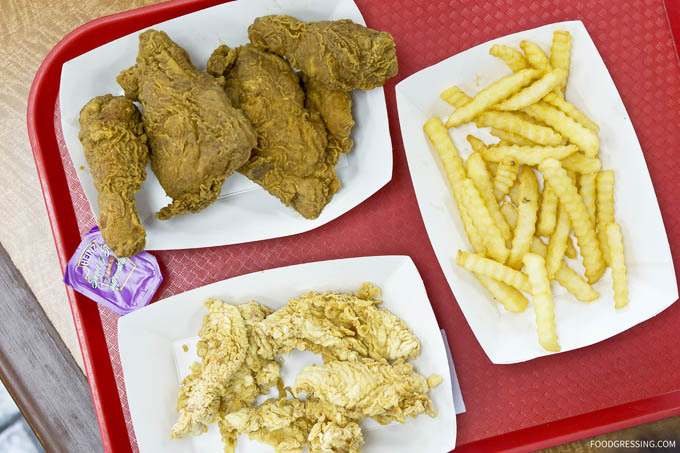 We went with 5 piece chicken tenders ($6.42) and Combo #4 ($11.65) that had 4 pieces (leg and thigh), small fries and drink. The chicken tenders were reasonably sized but the coating on the outside was extremely light in colour. What happened to that beautiful golden brown colour? In terms of texture, the coating was still crunchy and the meat was very moist. As for the 4 piece leg and thighs, the coating was too dark suggesting that the chicken was overfried. It was also more greasy than what I had at Church’s Chicken elsewhere.